Propane refrigeration units; how do they work? Here is the technical data on how gas or heating element-driven absorption systems cool your LP 'fridge or freezer. The continuous absorption type of cooling unit is operated by the application of a limited amount of heat furnished by gas, electricity or kerosene. No moving parts are employed. The unit consists of four parts: the boiler, condenser, evaporator and absorber. The unit can be run on either electricity, kerosene or gas. When the unit operates on kerosene or gas, the heat is supplied by a burner which is fitted underneath the central tube (A) and when the unit operates on electricity, the heat is supplied by a heating element inserted in the pocket (B). The unit charge consists of a quantity of ammonia, water and hydrogen at a sufficient pressure to condense ammonia at the room temperature for which the unit is designed. Click here to see a really cool diagram of how it works! When heat is supplied to the boiler system, bubbles of ammonia gas are produced which rise and carry with them quantities of weak ammonia solution through the siphon pump - C. This weak solution passes into the tube (D), while the ammonia vapor passes into the vapor pipe (E), and on to the water separator. Here any water vapor is condensed and runs back to the boiler system, leaving the dry ammonia vapor to pass to the condenser. 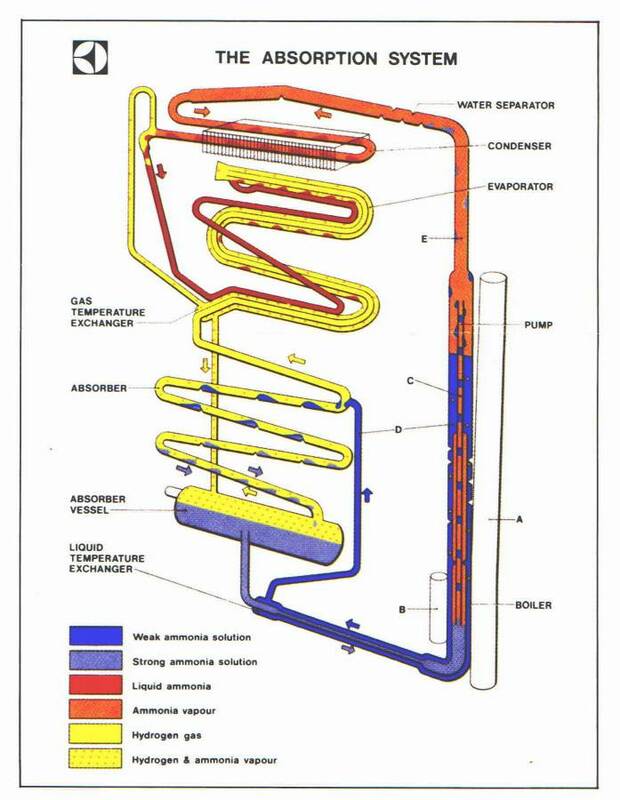 Air circulating over the fins of the condenser removes heat from the ammonia vapor to cause it to condense to liquid ammonia in which state it flows into the evaporator. The evaporator is supplied with hydrogen. The hydrogen passes across the surface of the ammonia and lowers the ammonia vapor pressure sufficiently to allow the liquid ammonia to evaporate. The evaporation of the ammonia extracts heat from the evaporator, which in turn extracts heat from the food storage space, as described above, thereby lowering the temperature inside the refrigerator. The mixture of ammonia and hydrogen vapor passes from the evaporator to the absorber. Entering the upper portion of the absorber is a continuous trickle of weak ammonia solution fed by gravity from the tube (D). This weak solution, flowing down through the absorber, comes in contact with the mixed ammonia and hydrogen gases which readily absorbs the ammonia from the mixture, leaving the hydrogen free to rise through the absorber coil and to return to the evaporator. The hydrogen thus circulates continuously between the absorber and the evaporator. The strong ammonia solution produced in the absorber flows down to the absorber vessel and from there to the boiler system, thus completing the cycle of operation. The liquid circulation of the unit is purely gravitational. Heat is generated in the absorber by the process of absorption. This heat must be dissipated into the surrounding air. Heat must also be dissipated from the condenser in order to cool the ammonia vapor sufficiently for it to liquefy. Free air circulation is therefore necessary over the absorber and condenser. The whole unit operates by the heat applied to the boiler system and it is of paramount importance that this heat is kept within the necessary limits and is properly applied. It's not working? Check out this diagram to see the most common reasons for cooling unit failure. visit our Full Site Index at Oasis Montana Inc.